NICE AND EASY: What is a mount? Several months ago, we told you about masts. A mast is just another name for a pole. So, then, what’s a mount? Well, if you’re King Arthur, it’s your horse. For everyone else though, it’s a specialized combination of a mast and a bracket. Let’s explain. 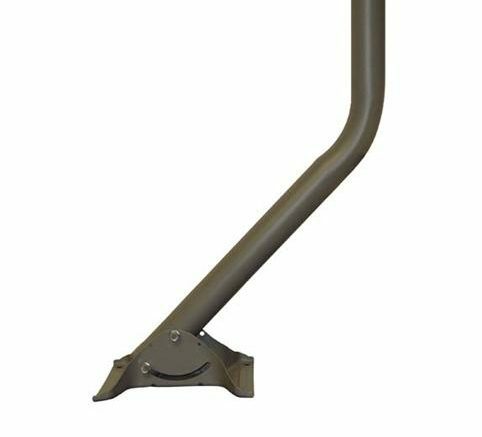 A penetrating mount, like the one you see here, has a bracket that bolts onto your wall, eave, or roof. In most cases it’s the most stable kind of mount, which makes sense considering the big bolts involved. However, there are a lot of times when you don’t want to make big holes, or you can’t. That’s where the other type of mount comes into play. A non-penetrating mount is specifically designed to let you put a dish or antenna somewhere without drilling any holes. Some of them have a wide flat base that lets you put cinder blocks on it for stability. Non-penetrating mounts designed for roofs generally fit under the shingles and are held in place by roofing nails. Strictly speaking, they do penetrate something but since they don’t penetrate any more than shingles do, it’s not considered a problem. Mounts come in all sizes, from tripods to long funny poles that look like elephants’ trunks to tiny stubby ones that let the dish almost sit on the roof. Pick the one that looks best and works best for your situation! DIRECTV Movies Extra Pack free trial going on Now! Why can’t you use “loop through” wiring for DIRECTV?